As October arrives it is now too late to be feeding bees sugar syrup as it will be difficult for them to reduce the water content down to store and use during the winter months.It ferments. But don’t fear as we can use Bakers Fondant at any time during these winter months. Just leave the Queen excluder on above the brood chamber and put a lump of candy above this so the cluster has ready access. (fuller details on Fondant feeding will be covered in a new article). The older bees will have started to die out and the new young bees bred in September and October will will sustain the colony through the long winter months. The Queen will still lay eggs through the winter and if it is anything like last year, as it was so mild, all winter. The bees will still be packing in the pollen they can find and if you spend a few minutes watching the front entrance of your hives it is amazing what different coloured pollens they are still able to find.The Ivy looks like it will flower well and this helps to boost the winter stores and encourages the Queen to keep laying. If you heft the back of your hive you will start to see what stores they have for the winter months I always find it is best to try and keep a lump of Fondant above the cluster then you will not get isolation starvation as the frosts arrive and they cannot move around the hive as they do when it is mild. The by word for October must be “Protection”. First and foremost ensure the hive is waterproof and they have plenty of ventilation. Those of you with Varroa floors should not have any concerns. 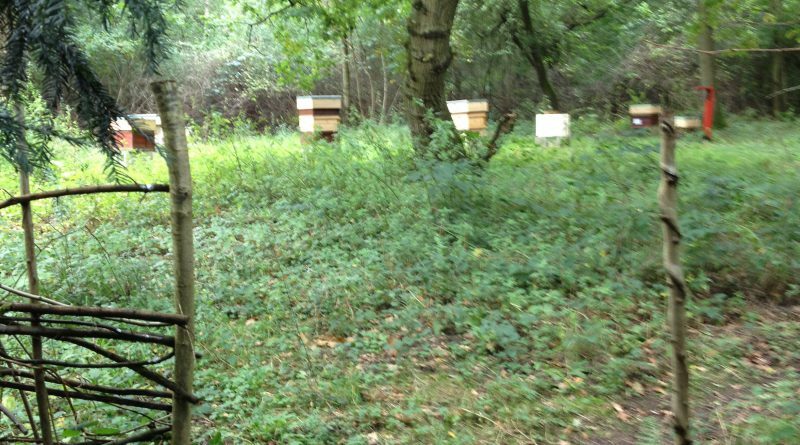 Hives if possible should slope towards the front entrance so any rain runs away from the hive and not back into it. We still have lots of Wasps and European Hornets around who, I can assure you, will find that weak colony in your apiary and will rob it out together with any Robber bees who will join in the fun as they have little else to do. Mouse guards should also be added now and also close the entrance down so it is easier to defend their home stores and young larvae. Some beekeepers reduce their entrances to three bee widths with a bit of masking/insulation tape. This does the trick when installed in the evening when no guard bees about as they are busy keeping warm. As the frosts arrive and worker wasps and Hornets are killed off the tape can then easily be removed. If you put on decent mouse guards you will keep the mice out. If you don’t, then once the bees cluster at one side of the hive the mice will make a home and a lovely nest in the other side. They will then destroy the comb and eat the winter stores and naw away at the frames as they get bored in those long winter nights. Worst of all are their toilet habits, as they have none, and smell is something to behold. There is also the threat of the Green Woodpecker which love our well maintained cedar hives. Their beaks are like a hot knife going through butter. They will hold onto the ledge of the hive,which the manufactures just make for this use of course, and then make the most enormous hole to feed on the bees and larvae. The good news is this is easy to prevent woodpecker damage with the use a good length of metre high rabbit wire which can stand loosely around the hive, leaving a gap away from the hive. This really annoys the woodpeckers as they cannot reach the hive surface. Other beekeepers use a sheet of plastic wrapped around the hive and secured to the sides or the crown board, preventing Woody having anywhere to grip onto as he goes about his winter feeding habits. Please remember to cut out an entrance so the bees can get out on foraging and cleansing flights. The good news is that in mild winters Woody has plenty of easier food to find normally and only attacks after a mild spell then frosts when their food becomes hard to find. Whilst looking for Varroa on one of my floor slides recently I found a greater wax moth trying to hibernate. Needless to say did not survive my intrusion so keep your eyes peeled when looking at the slides and put those enormous spiders in your super stacks either in the shed or stored outside with a metal Queen excluder top and bottom to keep out the Rats and Mice. I normally leave my varroa floor slides in during the winter having painted one side with white undercoat so I can see what is on there,then I take a magnifying glass with me to examine what the bees have ejected or has just fallen through. The odd Varroa mite is just the start of it with pollen loads,wax cappings as they consume their winter stores,other creepy crawlers and of course the occasional wax moth. It will also show you where the cluster is from the debris left on the tray so when you go to put on that lump of Fondant you can be in and out without to much disturbance. As we are now into October it is best not to be delving into brood chambers leave them well alone. Just keep them well fed, warm and dry and they will survive the winter without any further help. You just need to hope that your new queens are well mated as by now all the useless males better known as ‘drones’ have been ejected from the hives as they no longer serve a purpose. Life can be hard in this natural environment ! ← ASIAN HORNET – IT’S HERE ! !